Good morning everyone, we are half way through the week already and the week has already been a busy one, a friend of mine asked me recently, how’s things, still busy? And at that moment I realised that busy is the new normal, it’s not a bad thing, I enjoy being busy, being challenged but that doesn’t mean I don’t like time to relax, to just switch off and chill out, blogging does that for me, I love to get lost building a scene, trying to figure what works and what doesn’t, colours matching, lighting, shadows, and it really is peaceful. Don’t get me wrong, blogging brings alot of challenges too, it’s not as easy as some might think, but the good far outweighs the bad and on that note I will stop rambling and just let you check out the gorgeous set by Zen Creations, added to that their easel which is pretty awesome as you have a number of different pictures to choose from. 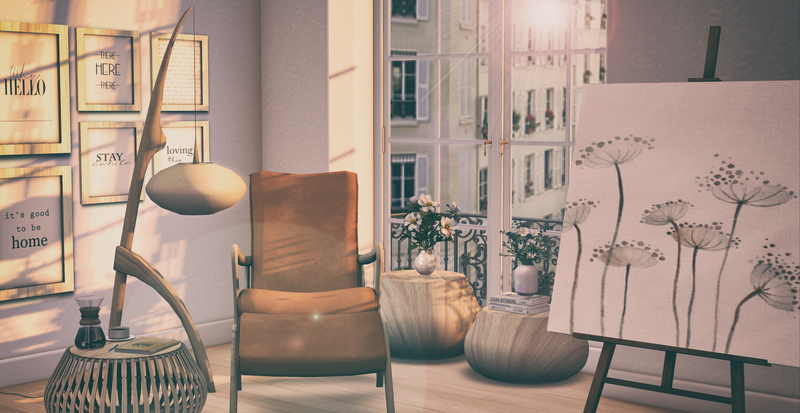 Anyway check out the details below, if you haven’t checked this store out yet, you really should, they have some really beautiful furniture, most of which come with a really useful hud to change colours and sizes. Beautiful photography, has such an incredible real life feel to this, love the background scenery chosen for this photo, shadows and wind light are fabulous, love it, thank you!